Christine has been invited to serve on an Expert Panel to review nanomedicine applications for the Networks of Centres of Excellence of Canada, in Ottawa, from Tuesday 14th to Friday 17th August. Congratulations to Jitkasem who received a Strathclyde Postgraduate Researcher Travel award! Congratulations to Intouch, who received the prize of the Conference of the Faculty of Medicine, Thammasat University (Thailand) (16th -18th July) for his poster entitled “Development of novel transferrin-bearing nanomedicines for cancer therapy”! Congratulations to Intouch who received a Strathclyde Postgraduate Researcher Travel award! Pint of Science: Scientists dust off their lab coats and head to pubs! Join us at Pint of Science event in Glasgow on 16th May and hear about seek and destroy nanomedicines for cancer therapy at Record Factory. Don’t miss out! New Doctor in the town: ​Congratulations to Dr Najla Altwaijry who successfully defended her PhD thesis on Friday, the 13th! Festive dinner for the lab! ​Christine was invited to give a talk at the 21st World Congress on Clinical Nutrition, which was held in Budapest, Hungary. Christine was chairing a session at the British Society of Nanomedicine Annual Young Researchers meeting, in Belfast. Najla gave a talk, both Najla and Joan presented posters at the UK and Ireland Controlled Release Society (UKICRS) 2017 symposium in Glasgow. Christine gave a talk, Sukrut and Najla presented posters at the European Nanomedicine Meeting, in London. Christine was invited to give a talk at the 10th International Conference and Exhibition on Pharmaceutics & Novel Drug Delivery Systems (Pharmaceutica 2017), which was held in London. Congratulations to Despo on her graduation day !! Despo delivered her MSc project presentation. Christine was invited to give a talk (“Développement de nano-médicaments ciblés à base de thé vert et de gènes thérapeutiques pour le traitement de cancers”) at the Café scientifique of the Alliance Française, as part of the Glasgow Science Festival. Christine was invited to give a talk (“Green “tea-rapy: a new weapon against cancer”) at the “Pint of Science” international festival in Glasgow. Najla was awarded the “Best poster in medicine and medical sciences” at the 9th Saudi Students Conference in UK (Birmingham, 2016). 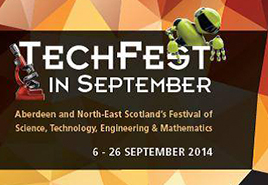 Christine was invited to give a talk (“Green “tea-rapy: a new weapon against cancer”) at “Techfest in September” (Aberdeen and North-East Scotland’s Festival of Science, Technology, Engineering & Mathematics) in Aberdeen. Christine was chosen as “Talent des Deux-Sèvres” (“Talent from the French department Deux-Sèvres“) in Le Courrier de l’Ouest. Sukrut received the “Best poster” award at Nanomedicine 2014 conference (Edinburgh). Christine and Sukrut were involved in the Strathclyde’s "Really Small Science" nanobioengineering public engagement event that took place from Thursday 17th October until Sunday 20th October 2013 as part of the Glasgow Science Centre’s "Bodyworks" exhibition. Their "Cancer targeting" dart game attracted more than 1000 people. Christine was awarded the "Tom Gibson Memorial Award 2012". The prize is awarded to recognise outstanding accomplishment and/or outstanding potential of young researchers involved in multidisciplinary research activity oriented towards enhancing developments in medicine and/or in its related sciences and technologies. The award is made biannually by the Royal College of Physicians and Surgeons of Glasgow and the British Association of Plastic, Reconstructive and Aesthetic Surgeons, in association with the universities of Glasgow and Strathclyde. Christine presented her research work to HRH The Princess Royal and to senior school pupils at the Medical Research Scotland "Meet the Researcher Showcase"
Christine received The Biochemical Journal Young Investigator Award. Christine presented her Tenovus Scotland-funded work to HRH The Princess Royal during her visit to Tenovus Scotland.